The adventures and misadventures of a Canadian born prairie raised expat living in Switzerland with her husband. He works for a department of the UN and she's trying to write a book. 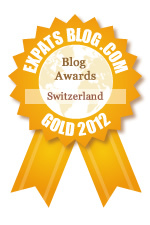 ExpatsBlog.com Expat Blog Awards 2012: Switzerland Gold Award! This blog won the Gold Award for best expat blog in Switzerland! Love, love, love this blog!!! Look for it on a daily bases even though I know she doesn't post daily, but, you know, just in case. Funny, witty but an honest retelling of what it must be like to just pick yourself up and move to another country. You can actually watch/experience her journey with her as she navigates or sometimes not, her way through. I really enjoy following this blog, learning about their adventures in new countries and hearing the familiar in reminiscences about home--all of it entertaining. I really enjoy reading this blog. I often laugh and cry while reading and listening to the adventures Tatiana and Johnathan are having while living their lives so far from home. Tatiana tells the tales of her expat adventures with such honesty and integrity. You really feel like you are a part of the good and the bad, and look forward to seeing what she is up to. I've laughed and cried reading her blog, and look forward to every posting. Also llamas. Looking forward to many more blog posts! I usually don't pay much attention to blogs, but this is one I really enjoy reading.There have been some that made me laugh some made me a little sad but at the end I'm smiling thinking of all the fun adventures Tatiana and her husband are having.Its a wonderful read no matter who you are and I always look forward to the next one. I have this blog bookmarked on my "check daily" list. I enjoy reading about Tatiana's adventures overseas, the experience of being away from home and so much that she loves and cherishes, and her daily life (successes and struggles). She writes with a sense of humour, poise, and perspective. Everything that she writes is real and true. I find this blog to be consistently interesting. It's not only the good, happy stories that get written about, but some of the unhappy events as well. It really takes me through the ups and owns of life away from the known and the familiar. I really enjoy reading this blog! There are some awesome descriptions of life as an expat but not only! Dubious hausfrau manages to keep the interest alive in all her narrations! Entertaining, informatory, cool - an awesome blog! Following Tatiana's expat adventure through this blog is like watching her grow up. She is honest, raw and beautiful. I love her style and the way she shares it all - the good, the bad, the inbetweens. I enjoy reading this blog as it affords me the opportunity to travel while being in the comfort of my home, it is also an interesting history class with no tuition costs and I enjoy reading about my aunt and uncle (I'm the flower girl with the black eye). Wishing you many more exciting adventures. Dubious Hausfrau does what every good writer does, shows us that in a way we are all the same. Everyone's adventure is different but we are all on one. It would be easy to say that it is well and thoughtfully written, that she puts her heart,life and soul on the line and that she works hard to share her experiences with all us because all of these things are true. What she really does is inspire. She inspires us to see the world around us as not just some regular place that we go to every day but a place where things happen. With honesty and integrity we learn as she learns to go out there to live and love in the biggest and best way possible. Tatiana's musings about her adventures in Switzerland are simultaneously amusing, interesting, and informative. What a wondrous blog! Well-written, informative, and fun, she shares her experiences in the manner of a close friend. T has always been an inspiration to me and through her blog she continues to do so. Her writing holds such emotion that it makes it feel like she not quite so far away. I enjoy Tania's quirky, unique view of the world around her. She encourages the reader to go.....hmmmmmmm. As a busy communications professional finding time to read anything for the sake of my own pure pleasure is difficult. This blog (along with a good cup of coffee) is one of the things that starts my day and leaves me with a smile that lasts well into the evening. Something that folks might forget is that when a family moves away to a new country, there are Expats of a different sort left behind in the homeland. I am Canadian not only for all the reasons my country is great, I am a Canadian because my good friends are what make my life as a Canadian complete. My freinds are part of my community. When Tatiana and Johnathan moved away a little bit of my community also moved away. Tatiana's blog helps ease the disconnect that the physical distance creates. Her blog keeps her in my heart and in my mind, and keeps my community whole. Sometimes living in Switzerland proves to be difficult: the Dubious Hausfrau 's blog helps coping with that. And Sippy Saturday is a must see.